Posted February 27th, 2018 & filed under kitchen designs. 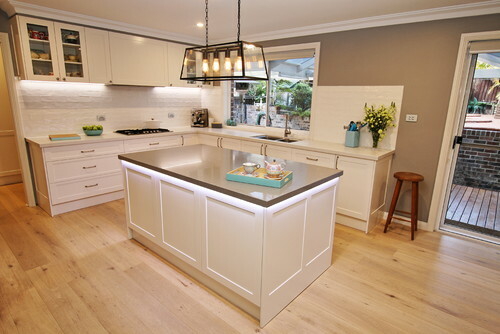 People in Sydney can utilize one of many flooring options for their custom kitchens. You can contact a planner in the city to find a useful flooring surface that adds an outstanding space that ties the entire room together. Look at a few of these flooring options for your kitchen to see how they may work. Wood materials are often recommended by a kitchen planner Sydney homeowners can trust. Wood offers a lighter look and has a natural touch to it. Bamboo and cork wood materials have become popular for offering light tones while being environmentally friendly. Concrete is often used by some planners in Sydney for how it offers a contemporary look. Concrete can handle large amounts of activity and can resist moisture. The surface can also be sealed to produce a nice shine while keeping the space from cracking or wearing. Laminate materials are ideal for surfaces that experience large amounts of stress. The faux wood layout can be prepared in any design one sees fit. It could include light or dark tones all around to establish a fashionable layout. Stone does not have to be used just outdoors. It can also be included in custom kitchens when sanded down well. Stone surfaces add a natural look. Stone offers a quality surface that can even be supported by a radiant heating sub-floor. This allows for an extra bit of heat in some cases. Ceramic flooring tiles are popular for custom kitchens too. Ceramic materials come in various colors and can even be paired with matching grout materials. They can also be cut into various shapes to establish an artistic look. Such tiles may also be fully trimmed to support certain surfaces. Any kitchen planner Sydney residents work with can help with planning a fine flooring surface for many needs. Check with The Kitchen Broker to see how well an attractive kitchen surface can be planned for you.